The first suggestion we make is to read what we said last year about the month of Shevat. What will be said this year will build on what we said last year. Below is the link to last year's Blog about Shevat. Please press your back button to return to this location after you read last year's Blog. Name: Shevat שבט . The word Shevat means Tribe. It also has the meaning of Scepter. The nature of the astrological connection to the month of Shevat is about your Tribe. This is expanding the idea of a Tribe being an extension of your family. Your consciousness is going to determine the extent to which you expand your consciousness to include in your "Tribe." Do you think of yourself as a member or citizen of your state or country or are you a member of the human species. This is one of the aspects of the energy of Shevat. The idea of a Scepter is a tool that identifies your power. This is due to the idea that the Heads of the Tribes hold the Scepter of office. This is an aspect of people outside of you have sway in helping you to determine your values and goals. Concealed in the month of Shevat is the energy of the Day of Rest called Shabbat. This comes from the notariken (letter substitution) method of substituting a Tav for a Tet. They both have similar sounds. When this is done the word becomes Shabbat שבת. This truth is teaching us about the period of Shevat which is the beginning of spring. Shabbat is a rest day. Gestation is also a rest period preparing the fetus for entry into the world. Shevat is that kind of period for us. Attribute: Taste - ליטה - Leetah. This attribute reflects the energy of Shevat where it relates to the spices we add to our food to give us pleasure. Our food can be pleasurable or not as our consciousness relates to the events of the month. Ancient Tribal Connection: Joseph - יוסף . Joseph has the meaning of "shall increase." This concept of increase is the natural essence of the energy of spring. Renewal implies increase. New growth must include an increase over the winter declines. Joseph is also the chariot for the Sefirah of Yesod which translates as foundation. Yesod is a funnel that gathers and shares. It brings the Shefa from the spiritual level of Blessings and distributes them throughout the physical world while it is also gathering the prayers and actions of mankind and elevating these actions to motivate a continuous flow of Shefa. It does this using the Creative energy and Sexual Power. Modern Tribal Connection: Asher. אשר . Asher has the meaning of Happiness. Jacob's wife Leah named the child from the surrogate mother Zilpah (Leah's handmaid) Happy or Asher. Yet it is a bittersweet happiness since she was unable to bear the child herself as she would have liked. She was happy to provide Jacob a fifth son, yet she would have preferred if that would have happened with her as the birth mother. Tribal Totem for Joseph is complicated. It includes three different animals. One for Joseph, one for Efraim, and one for Menashe: פורת - שור - רעם Porat is the Totem for Joseph, which translates as Wild Donkey. The actual word for Donkey in Hebrew in Chamor. Chamor also has the meaning of the physical world. Joseph as the chariot for Yesod is in control of the physical world and explains this Totem. Shor is the totem for Joseph's youngest but most prominent son Efraim. Shor translates as Bull. Some of the modern Kabbalists translate this as Buffalo. These modern Kabbalists explain that the Buffalo has the capacity to diminish the frenzy of the angry bull and redirect this energy toward a more creative and constructive aspects. The Rayam is translated as an Oryx which is a large powerful desert dwelling Antelope. The Rayam represents an opposite essence of family which is related to the Shor. The Aquarian child will sometimes need the Family and Home to nurture its growth and sometimes will be stifled by the family and need the freedom of the wild donkey. One final point to keep in mind, the Shor has the same letters as one of the Names of God Vav Shin Reish which deals with recognizing patterns of behavior including patterns of mistakes that remain uncorrected from lifetime to lifetime. This helps to explain the genius of the Aquari person. Tribal Stone: Onyx שהם. The Shoham stone has the quality of charisma, illusion, delusion. 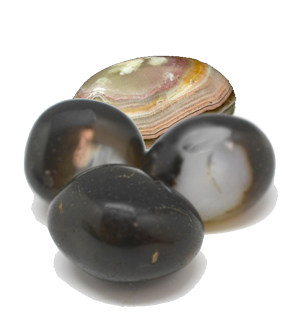 The onyx stone has the paradoxical power to remove delusions from people who have them and to give delusions to people without them. The onyx stone has the essence of medicine. Take too much and you will get sick, while in the correct amount it assists you in returning to balance. It is for this reason that the onyx stone is to be used sparingly. Tribal Herb: Smoke Rising Plant מעלה עשן Maleh Ashan. This plant is very important to the mixture of the Ketoret. It is not included in the 11 components but is mixed with them after they are mixed. 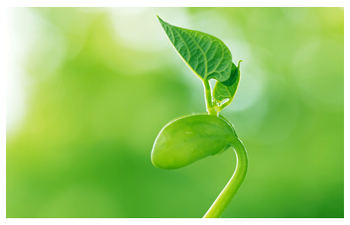 This plant has the ability to rise straight up to heaven without deviation, just as the Aquarian has the ability to balance family and "saving the world." The knowledge of which plant this is has been lost. It was the secret of one family of Cohenim. The final descendants of this family tried to pass the information to Rabbi Akiva after the destruction of the Temple. When the scroll with the information was opened it disintegrated into powder. The teaching that the Sages took away from this incident is what is yours will be yours and never worry about losing it. What is not yours will be taken from you and one need not worry about its loss. This knowledge will be returned to the Cohen family from which it was removed when the appropriate time arises. House: House of Love בית האהבה . The essence of the House of Love is "sharing." Giving to others without an expectation of return. Zodiac Sign: = Water Pitcher דלי Delee. The water pitcher acts as a vessel for the energy of water which is Chesed or Loving kindness. 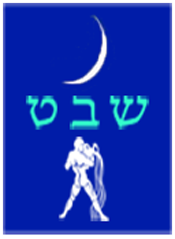 Tribal Flag: For Efraim שחור עד מאוד Shachor Ayd MeOd. This flag is black with the emblem of the Shor. Black is the color of reception or vessel. The connection of the Light in the form of the Shor or one of the 72 names of God and the vessel represented by the black color represents the idea of unity as represented by Joseph being the second in command in Egypt. The Tribal flag for Menashe is the same except the animal is the Rayem which attribute represents power and agility. Tribal Direction: West מערב MaArav. MaArav can be translated as "from the evening." This relates to the idea of Sefirah of Malchut dealing with Manifestation. 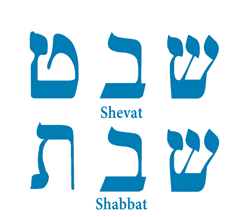 The Name of this 11th month of the Hebrew Calendar is Shevat spelled with Tet as the last letter. The month of Shevat seems to be two different months in one. The first two weeks prior to the Holiday of Tu B'Shevat reminds of the month of Tevet and the energy "seems" to be unchanged. The last two weeks after the Holiday are very different. These last two weeks transform into a much more positive month. The energy of these two periods is really the same but feels like two different aspects. One aspect is Appeasement and one aspect is Abundance. What is the difference? Appeasement is sharing that feels like giving. In Kabbalah, giving is sharing with your own agenda while sharing has no personal agenda. Sharing is when you are a channel for the Light to share through you to another person. Appeasement has a bad connotation in the western world since the 1930's when the West appeased the voracious appetite of Germany and its Leader. It was not truly sharing even though so much was given. In effect it is a transfer of resources from one to another under duress of some type. Abundance on the other hand is usually thought of as relating to physical resources; yet it actually applies to both spiritual and physical resources. When things (spiritual or physical) are in abundance people find it easier to share. Yet unless it is acting as a channel of the Light of HaShem it is simply giving under another name. That is actually the Tikune during Shevat to become a channel for the Light of HaShem and remove your own ego from the equation. Of course, this is the Tikune in any month; only in Shevat it is more concentrated. The whole month of Shevat is included in the period of Shovvavim and is a good time to relate to your tikune - correction for the Sefirah of Yesod. Yesod is usually thought of as the sexual organs. It is also an aspect of the Creative energy. It is a good time to plan and seek change from your previous year, as you prepare for the holiday of Pesach and spring. This year Rosh Chodesh Shevat corresponds to the evening of January 20 and the day of January 21 2015, which falls on a Wednesday. The Holiday of Tu B'Shevat is also on Wednesday. Please remember that Rosh Chodesh is announced by Man, not an effect of the cycle of the moon. Please see below in the section on the Holiday for a meditation that will assist you in balancing your individual energy and also balancing our Global energy so mitigate the effects of Global Warming. Shevat being the 11th month also represents the Malchut. Yet it is not the final step since there one more month in the year. There are two aspects to the number 11 just as there are two aspects to the energy in Shevat. 11 represents being more than 10. It represents the idea that there is a negative system that is not included in the 10 Sefirot. There is a negative system that is created to oppose the positive system of the 10 Sefirot. At the same time there are 11 components in the Incense that was burned in the Temple. That incense represents a tool to bring us closer to HaShem. One of those components smelled horribly when burned by itself. When burned within the Incense all 11 worked together to create a smell that is heavenly. Shevat teaches us that the negative side is necessary; yet it must be limited and controlled so that it does not take over the Whole Process. The letter Bet is related to Blessing while the Letter Tzadi is related to Righteousness. Both letters represent balance and the Central Column of the Tree of Life. The month of Shevat gives us the opportunity to reveal Truth and Light and Goodness in our life and in the quantum level consciousness of the world. It is for this reason that Shevat is called the month of Redemption, since the physical world is usually thought of as darkness and exile. Of course, normal people do not think of this world as an exile from our true home. Our true home is with the Creator in Heaven. This consciousness is necessary to help bring the Mashiach with Mercy and avoid the Armageddon War. Now, let us look at the permutation of the Tetragrammaton for the month of Shevat and what we can learn. The Tetragrammaton is normally spelled יהוה. The Yood is in the first position. The first position is normally considered the World of Atzilut (Emanation). The second position normally has a Hey and is considered the world of Beriah (Creation). The third position normally has a Vav and is considered the World of Yetzirah (Formation). The fourth position normally has a Hey and is considered the world of Assiya (Action or Manifestation). This normal permutation which is used in the month of Nissan puts the Name of God in its normal, proper, and optimal placement to provide for the maximum flow of the Beneficence of HaShem. In essence the Yood, in the World of Atzilut, allows for a concentrated point of connection to the World of Ain Sof or Endless World. The upper Hey in Beriah expands to support actual birthing and Creation. The Vav then channels this energy of Creation into the final Hey in the World of Malchut which is Manifestation. When we look at the permutation for Shevat, we see the upper worlds in reverse order, the Hey prior to the Yood, while the lower worlds have the regular order of the Hey following the Vav. When the upper worlds are in reverse order we know that the energy influx is extremely strong and the mental level requires a lowering of its vibration level in order to handle that much energy. This is then channeled through the heart and finally into our world of action. The Tzadi is the letter that created the sign of D'li or the Aquarian sign. The Tzadi also created the month of Shevat. D'li translates as a bucket usually called a "water bucket." Another metaphor for the sign of Aquarius is the water carrier not just the water bucket. In Kabbalah, water is always a sign for Torah and also for the energy of Loving Kindness which is translated as Chesed. The Tzadi letter is cognate to the word Tzadik which represents the complete and fully corrected individual man. The Tzadik is always doing the "Right" or Correct action. Always. In fact when someone does a Right action at that moment they have the consciousness of a Tzadik. Yet they can not maintain that consciousness. In Aquarius we find it easier to maintain ourselves in doing the Right actions. This is because the universe supports the Right actions of sharing, as described above. It also explains why the period of Shovavim occurs over the month of Shevat. The Bet created the planet Saturn which is the furthest planet from the sun of the visible planets (the 7 inner planets). As the furthest from the sun Saturn appears distant and cold and this just reinforces the idea that the physical world is the most important. This is why the Capricorn people develop ideas about their having built what they have accumulated materially over their lifetime. This is clearly a wrong image since everything comes from the Creator. Now that we are in Shevat we would expect this same energy to be manifesting but it does not. This is explained by the physical cause that the planet Saturn always has one side of the planet facing the sun and the other side facing the openness of the universe. These are the two aspects of the Bet and of the differences between Capricorn which is always limited to the solar system and the open look of the Aquarian trying to save the universe. The gematria of the Tzadi and Bet is 92. 92 is equal to 91 plus the Colel. 91 as we know represents the unity of the Spiritual and Physical worlds. 92 has this energy even at a stronger more intense level. This unity is what allows the Tzadik to do the Right action. There is only one Holiday in Shevat. It is the Holiday of Tu B'Shevat. This Name translates as the 15th of Shevat which is the date of the Holiday. It is also the date where the Talmud teaches us that rain in Israel defines a different level of consciousness. If it rains prior to the 15th of Shevat this rain waters the previous year's crops. If after Tu B'Shevat it waters this year's crops. This matters for the purposes of tithing the crops. There is also a teaching in the Talmud which explains that the Sap that runs in trees and indicates the beginning of spring starts to flow on Tu B'Shevat. The Kabbalists started or revealed the idea of a Seder to be done for the fruits and to enhance this idea of spring and the rising of the Sap about 600 years ago. This Holiday is actually a celebration of the ecology as well as the tool of Binding by Striking. In Kabbalah gravity is the energy of the desire to receive for oneself alone. Gravity is the cause of every aspect of mass desiring (or causing to flow towards) every other aspect of mass. Trees are the tallest living thing on our planet. Why do they grow so tall? The Kabbalists explain that the Trees have an innate energy of the desire to receive in order to share. 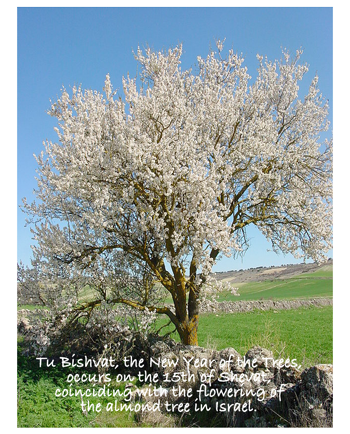 The Holiday of Tu B'Shevat is the New Year for Trees. Actually, Tu B'Shevat is one of 4 New Years in the Hebrew Calendar. Rosh Hashana is one, Tu B'Shevat is another, a third is First of Nissan the New Year for Kings, and the 4th is the First of Elul. The New Year in Elul is used to tithe the kosher animals for the Year. If an animal is born after Rosh Chodesh Elul it is tithe as coming from the group tithed in the following year. As said above, this year Tu B'Shevat is on Wednesday. This year unlike most years the Shabbat Shira. is the Shabbat prior to Tu B'Shevat. It is the Shabbat Named Song of the Sea. It is the Parasha that reveals the 72 Names of God; Also, the 72 Names from the Tzadikim; Actually there are 9 other permutations of the three verses at Exodus Chapter 14 Verses 19 to 21 for a total of 11 permutations. As indicated above, when we need additional energy to balance the negativity in the world HaShem provides this by having the Holidays coincide with Shabbat. Remember this does not happen due to the calendar. It happens because men declare the new month. HaShem sends his Angels the Teli (from Sefer Yetzirah fame) to influence the declaring the new moon so that the Holiday or Rosh Chodesh or both fall on Shabbat. THIS IS HASHEM'S MERCY IN ACTION. By hearing the Torah Reading on these Shabbatot (plural of Shabbat) we receive the additional energy of the Maftir for Rosh Chodesh and the Haftara for Rosh Chodesh. These readings assist us in receiving the enhanced energy of Shabbat and the Holiday in a balanced way. There are no other high energy days except Tu B'Shevat and Rosh Chodesh Shevat. Actually every day is a High Energy Day complete with the energy of Shovavim. Here is the link to the Tzadikim from Shevat. I suggest you spend some time during this month checking out the attributes of the name Asher and the Name of the Nasi who gave the dedication and his consciousness of why he gave what he gave. Remember not all of these attributes are positive and with the tool of "Binding by Striking" we can correct them and transform them into positive aspects. Here are strategies to adopt for this month of Shevat. 1. Do New Things Shevat is the month of renewal which we refer to as spring. By doing actions that are new you achieve to different connections. One you bring yourself to the consciousness and excitement of spring and you also take yourself out of your comfort zone which is an attribute associated with Binding by Striking. 2. Learn Torah When we study Torah we are listening to Hashem speak to us. When we learn Torah we manifest those words from Hashem in our lives. This month add some additional study time and take the words you study into your life through practical means. When was the last time you went to an old age home or a homeless shelter and visited with someone you do not know so that you can bring joy and human compassion into their life? You will also receive this compassion and joy in your life. 3. Be Conscious as You Eat The month of Shevat, according to Kabbalah, corrects the sense of eating. This correction is achieved when we become conscious as we eat and also of what we eat. Is it healthy? Is it just the first level of consciousness? Is it Kosher? Is it another level? Do you think about what you chew? Are you chewing your food 101 times like your parents taught you do do? Of course, they probably told you to do what they say and not what they do. Perhaps this Shevat you might try to learn the Hebrew Blessings over Food as well as the Hebrew Blessing for after eating. This is one step in correcting the aspect of eating, which is one spark of Light that can only be fully corrected when Mashiach comes. This is due to the reality that we must eat to live and therefore can not totally correct the desire to receive for oneself alone. Although a good step is to eat only to give pleasure to the creator who created what you eat for your pleasure. This consciousness creates a complete circuit of energy and you will find that you will eat less and loose those pounds you promised to lose this year. You will also find your immune system being strengthened as well. 4. Look into becoming vegetarian or Kosher. Most people do not know that we will reverse the process of the Fall of Adam as Mashiach manifests in this world. This means that the evolutionary process which the scientists have gotten almost right will reverse itself. Man prior to the flood did not eat meat. This will be true when Mashiach comes as well. Learn about the energy of food such as foods grown close to you are better for you than foods grown around the world from you. Also, learn the energy of food such as not mixing milk and meat which are code words for continuity and end. Learn why there are two signs for a kosher animal - chewing its cud and cloven hoofs. Cloven Hoofs represent Left and Right column energy running through the animal. Chewing its cud represents in built Binding by Striking that allows the energy in the animal to balance itself so that it is easier for the human being to maintain balance when he eats an animal. There is so much more to learn about eating in the Torah way. If your lunar north node is in the Zodiac sign of Shevat, your Tikune is in Shevat. If your lunar north node is in the Zodiac sign of Aquarius, your Tikune is in Aquarius. You bring the traits of the Leo into this life from your last lifetime. You are a true monarch, returning to the physical realm to correct pride left over from your previous incarnation. In your last incarnation, you dominated your subjects. You lived in the limelight. You loved flashiness and luxury, and as a result you will not find it easy to do without. Moreover, overcoming your pride will not be the obvious thing to do, since pride has been reinforced in previous reincarnations. The tikune in Aquarius will make you face difficulties in your marriage—namely, accepting a partner as an equal with whom to share everything. This is the preliminary “drill” to overcoming your pride. At the outset of your present incarnation, you still sought the admiration to which you were formerly accustomed. You arrogantly exploited your power to control others. Considering yourself the center of the universe was your way of expressing a need for love and gratitude. You had to struggle to discern reality. Having lived in an artificial world, you had great difficulty finding a spiritual path. As one used to ruling over your subjects, climbing down does not come naturally to you. A tikune in Aquarius engenders certain obstacles in relationships. In marriage, for example, you must slowly but surely abandon your preoccupation with your own selfish desires. You will have to exchange your sacrosanct independence for a new concept: interdependence. This world is not “me” versus all others; we are all equal on the same level. If you give up honor and glamour, you will succeed in creating an immense restriction and take control of the duality of your correction—your personal life and your humanitarian mission. The tikune in Aquarius is, in fact, that of the true missionary. You can attain the consciousness of a cosmic reality and feel responsible for humanity as a whole. You can know true friendship and perhaps even universal fraternity. Having inherited a leonine power, you have the strength to accomplish this task. Utilize it for the benefit of all. You can experience an exceptional and unique adventure in the history of humanity if you manage the most difficult restriction: silencing your ego and practicing humility and modesty while living in simplicity. I am going to end this blog with a wonderful story suitable for Shevat and Aquarius. In Second Temple times there lived a man whose name was Micah. Micah dreamed of World Peace and the coming of Mashiach. He decided to help manifest his dream so he built a very special house that would emphasize and embody his dream. He built his house out of stone. This was because he did not want to destroy any trees to be used in his house. He did not want the energy of destruction to be connected to his house. Destruction and Peace do not have affinity. He did not use any metal to carve or cut his stones that he used in his house. This is because metal is used in war and war and peace do not have affinity. He built the house with his own hands and when he was completed, he planted a fig tree in the garden outside his house. Micah envisioned that people would come from everywhere in the world on their way to Jerusalem to the Third Holy Temple as we all are going to do after Mashiach. Micah envisioned people eating under his fig tree in his garden and then he would leave the crumbs for the birds to eat and the result would be the birds would pick up and clean away the crumbs from the table as a service to Micah. One day a Prophet came to eat at his house. Micah like Abraham our Patriarch was very sharing. He provided a place of rest and food and other comforts for anyone who came by his house. After all it was a house of peace. Of course, he never charged anyone for these services and he did not even ask for donations unlike many people in our generation. Micah did not know the man was a Prophet. When the Prophet was finished with his meal, he offered Micah to pay for it. Micah knew never to say no so he accepted some money in payment and immediately put the money back into the coat of the Prophet. The Prophet knew what he had done. 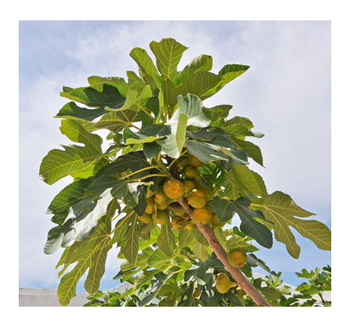 The Prophet Blessed Micah by saying, "In heaven they are so impressed with your house and your sharing, HaShem sent me here to tell you that one day a child of yours will eat a fig from the tree outside of your house and this action will manifest Mashiach." At that time, Micah did not have any children. The next day the Temple was destroyed and Chas V'Shalom Blood ran in the streets of Jerusalem. Micah went into exile along with the other members of his family and his Tribe. 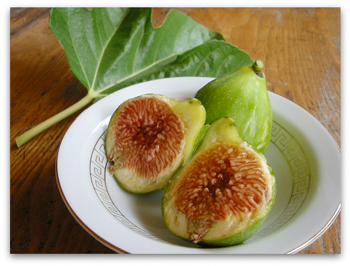 This is why people serve figs to their children, because, maybe the fig they serve to their children might be grown from a tree that grew from a seed that came from Micah's Fig Tree. And maybe the hearing of this story by their children will mean that their children will also have a Dream of World Peace and thereby be considered a child of Micah. Maybe this child eating this fig will manifest Mashiach. Maybe or Perhaps the teachings of Kabbalah will catch on and people will know that this child is a child of Micah and they will know that this fig tree is outside of Micah's house outside of Jerusalem. AND THIS ACTION IS WHAT WILL MANIFEST MASHIACH both metaphorically and physically depending on your world view. Have a wonderful Peaceful month. You CAN bring your Mashiach and thereby the global Mashiach this month. The universe will support the consciousness of Let Go and Let God. If you try to hold onto your negativity the universe will kick you in the groin during this month. Let go and you will be amazed at what can be accomplished towards world peace and joy. Shevat can be a very stimulating month or you can remain in the coldness of winter. The choice is yours. Just try to do the whole process one step at a time.